Year-end spending bill did not include riders to stop DOL fiduciary rule, but Rep. Ann Wagner vows to defeat the rule in the new year. 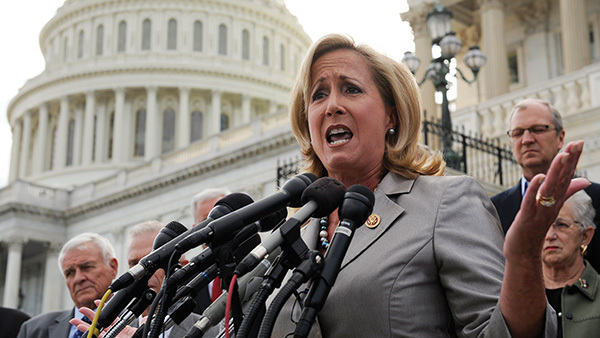 Rep. Ann Wagner wasted little time in vowing to continue her efforts to defeat the Department of Labor’s rule to amend the definition of fiduciary on retirement accounts after the omnibus spending bill failed to include riders to stop DOL’s plan. While Congress reached a deal late on Dec. 15 on the $1.1 trillion omnibus bill, supporters of DOL’s bill to amend the definition of fiduciary under the Employee Retirement Income Security Act are bracing for other assaults on the rule. A vote on the package was expected by Dec. 18, though Republicans and Democrats will hold conferences on the bill before final passage. The bill also includes a funding boost for the Securities and Exchange Commission and advances a tax extenders package. Wagner, R-Mo., pledged that she would continue to “fight until the rule is delayed, dismantled and defeated.” She sponsored the Retail Investor Protection Act, which passed the House in late October and would require the DOL to wait for the SEC to move on its own fiduciary rule. It’s “now more important than ever that the Senate act immediately and take up this important piece of legislation,” she said. But a rider to the spending bill was opponents’ “best opportunity to kill the rule before it was completed,” said Barbara Roper, director of investor protection for the Consumer Federation of America. Once the fiduciary rule is finalized, Congress could pass a resolution to disapprove the rule within 60 days under the Congressional Review Act. But President Barack Obama would likely veto such a resolution. Senate Minority Leader Harry Reid, D-Nev., commented after the omnibus deal was struck that Democrats were able to “beat back” Republicans’ attempts to “undermine” DOL’s fiduciary rules as well as weaken Dodd-Frank banking regulations. The spending bill also includes $1.61 billion for the SEC, $105 million more than the 2015 enacted level. SEC Chairwoman Mary Jo White has said that the agency would use some of the increase in funds to add to its stable of examiners. But the bill includes no new funding for the Affordable Care Act or the Internal Revenue Service. The House Rules Committee met on Dec. 16 to consider the omnibus bill as well as the tax extenders package. The House was expected to vote Dec. 17 on the tax extenders package, which is tangled up in the omnibus bill. The bill also extends permanently the research and development tax credit, and reinstates other tax code provisions that expired last year. Lawsuits as well as legislation to replace DOL’s rule remain in play. Opponents “will doubtless continue [their] multi-front war” on the DOL rule, Roper said, adding that the “next big challenge to the rule is from the inevitable industry lawsuit,” as well as “additional headaches” from Congress. Dale Brown, president and CEO of the Financial Services Institute, noted that while “the odds of passing an omnibus bill with a rider […] were always slim,” that rider “is not Congress’ only chance to act,” adding that FSI is “pleased” with the efforts of Reps. Roskam and Neal to drive a bipartisan solution to this critical issue. “Congress not only has the right but the duty to fulfill their legislative role and protect retirement savers. We note that Sens. Portman and Cardin have stated their strong belief that congressional involvement is essential. This is why all advisors must get engaged in the legislative process and advocate for hard-working Americans trying to save for a dignified retirement,” Brown said. — Read “DOL Fiduciary Rule Won’t Slow IRA Rollovers: Cerulli” on ThinkAdvisor.